For just the second time in nearly three decades the Crimson Tide got a road win over the Commodores to improve to 15-8 (6-4). Galin Smith was still out with a concussion and Alex Reese was out with the flu, leaving the bench a little short. Donta Hall got into early foul trouble again, further exacerbating the problem and forcing us to change the game plan a bit. 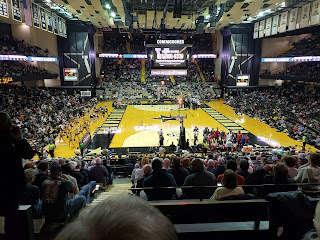 Normally, shooting 24 from three point range in that place is inviting disaster, but we were able to make half of them and actually shot better from 3 point range than Vandy did. Donta Hall even made his first and only career three pointer despite bricking it off the back of the iron. 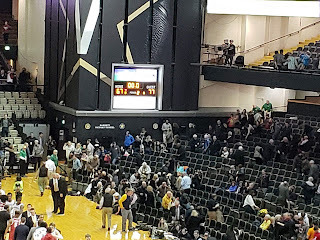 It was close through much of the first half, but Vandy had a prolonged scoring drought that allowed us to stretch the lead to 7 going into half time. For all of Coach Avery's faults, we should really give him credit for his ability to make adjustments at halftime. We've been really good in the early parts of the 2nd half of most games lately, and this was no exception. We were forcing turnovers and running after Vandy misses to speed up the game. Dazon, Riley, and Kira all made big 3s to extend the lead to 19 points with about 9 minutes remaining. Unfortunately, we weren't able to put them away. Dan was called for a flagrant foul after a lengthy review, and that seemed to give the Dores a spark. We had stretch of bad turnovers that led to a 10-0 Vandy run. I thought Coach Johnson waited about 3 possessions too late to call a timeout, and suddenly Vanderbilt was back to within 5. That's when Riley Norris stepped up by making 3 free throws, then drilling another 3 pointer to put the game away for good. Riley was the MVP in my opinion. He had a double double with 15 points and 12 rebounds on a night he was desperately needed with a short bench. Kira was unstoppable much of the game until he got frustrated during Vandy's second half run, but he still finished with 18 points and 4 assists. Dazon was also in double figures with 12, and Herb had a solid game with 9 points going 4 of 6 from the field. Hopefully this is a sign Herbert is coming out of his funk. 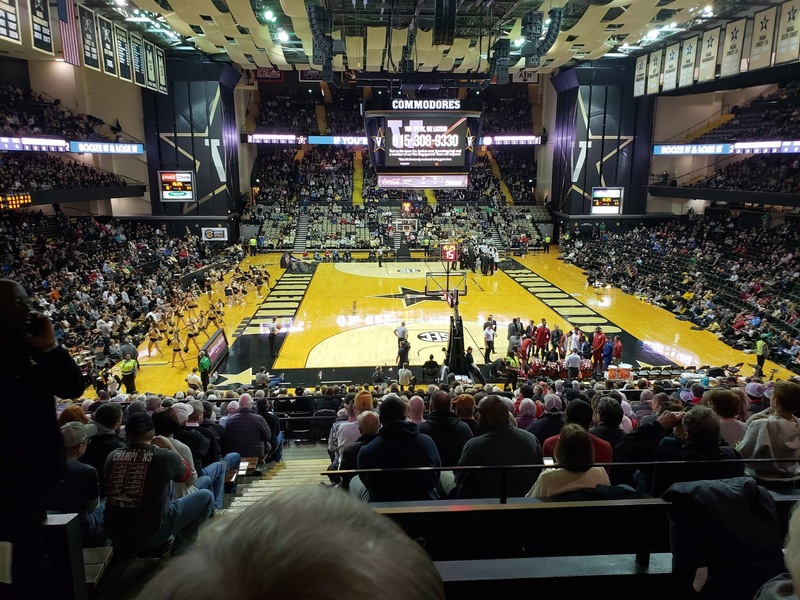 Memorial Gym is still the same out-dated horrible arena that it's always been, but they have made one positive change by going to a traditional goal support. See the picture at the beginning of this post that I took from my seats at the game, compared to this old picture below. I'm not sure when they made the change, but I do believe it somewhat neutralizes one of their advantages, as that old support was very unusual and made the shooting background even worse. The gym holds about 15,000 but because of its goofy configuration it is very difficult to estimate the crowd as you can only see a portion of the seats. There seemed to be quite a few empty seats and my wild guess at the attendance is in the 6,000 range. The North Alabama and Nashville area alumni were out in force. We probably had nearly a third of the crowd, with our section being overwhelmingly crimson. I thought we were louder than the Vandy fans all night. There was one Vandy fan sitting in front of me, who asked me after the starting lineups, "do you all have any white boys on the team?" I prefaced my answer with, "I'm not sure why that matters." 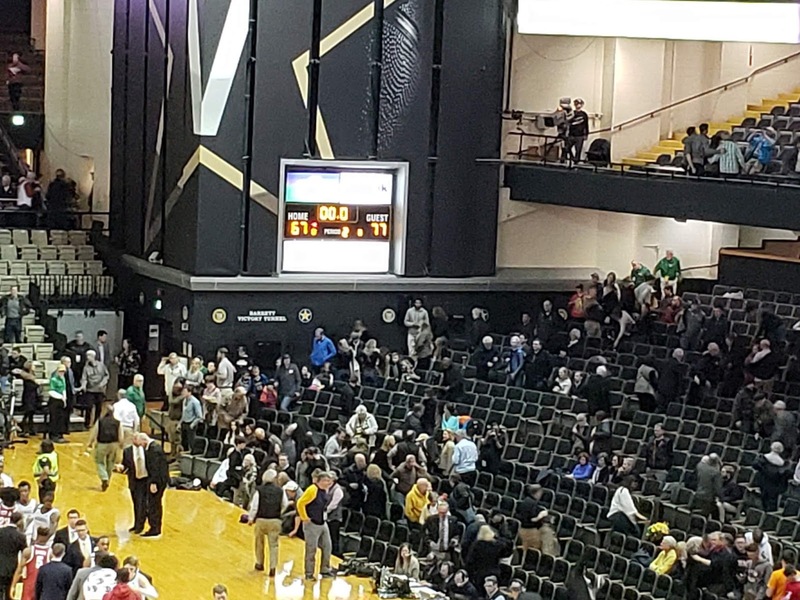 We also witnessed a verbal altercation between some drunk Vandy students and a group of Bama fans outside the arena after the game. I guess those racist, elitist pricks will just have to look elsewhere for their first conference win. It wouldn't hurt my feelings at all if it never comes. Up next, speaking of obnoxious fan bases, we travel to down highway 82 to take on the Mi$$i$$ippi $tate Bulldogs Tuesday night in Starkville. Tip off is set for 8 pm on the SEC Network.